It seems that in London, the weekends are feast or famine when it comes to Arts and Culture events. 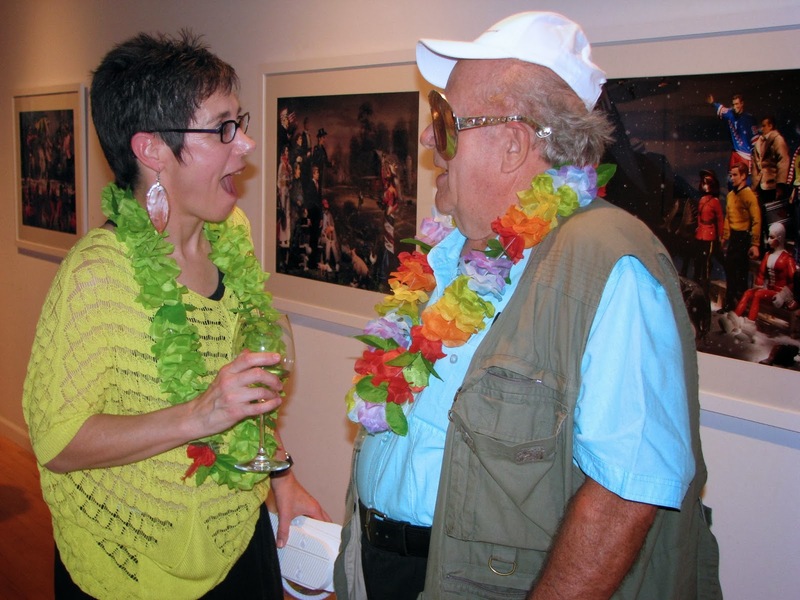 Last weekend there were at least three art exhibit openings downtown. I managed to attend two of them, both exhibits of new works by women artists whom I was looking forward to chatting with. 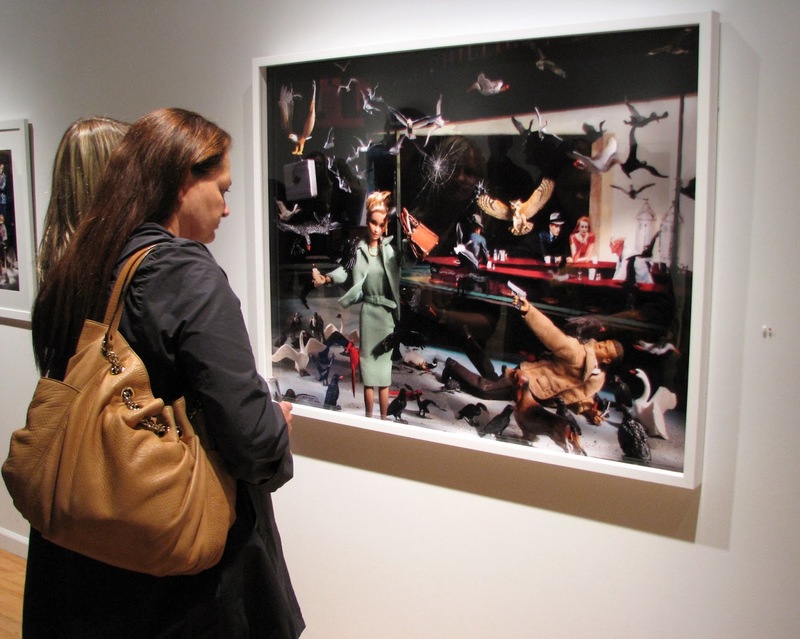 On October 3rd, Winnipeg artist Diana Thorneycroft's exhibit, titled "Canadians and Americans (Best Friends Forever....It's Complicated)" opened at the Michael Gibson Gallery. 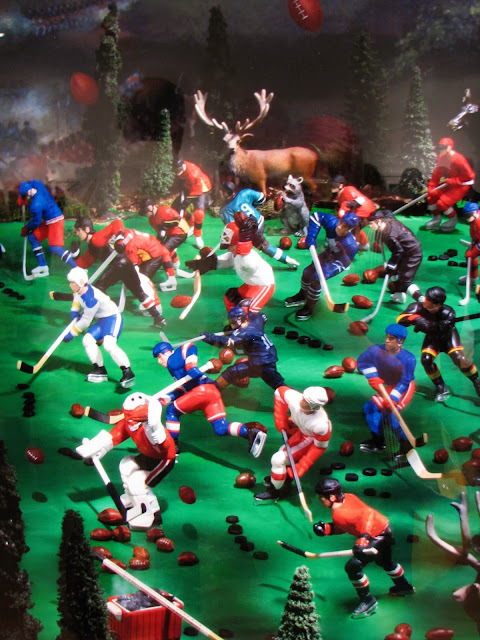 Thorneycroft's recent works have used moments in Canadian history, Canadian stereotypes and national identity as subjects for large format colour photographs that resonate with a delightful black humour. 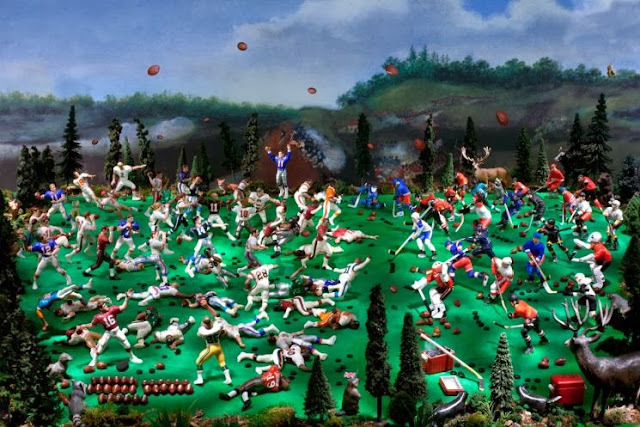 The photos in her current show feature backgrounds of famous or familiar landscapes, populated with action figures and dolls representing American characters, acting out narratives that examine our experience with American history and popular culture. Bits and pieces of Canadiana manage to infiltrate each narrative. 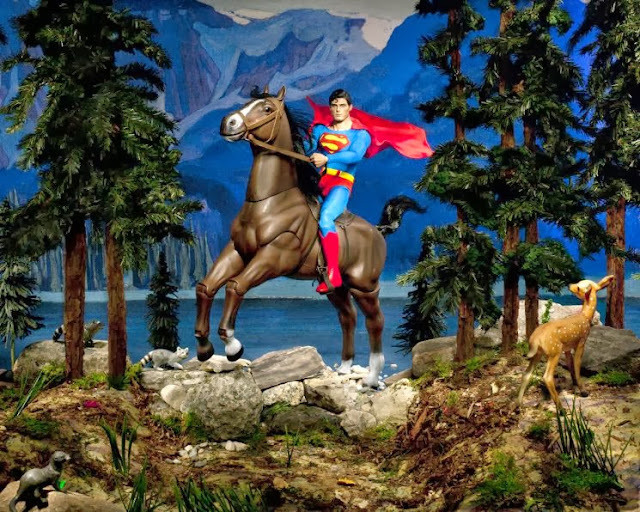 "Lake O'Hara (Clark, Northern Dancer and the Evil Weasel)"
At first viewing, I didn't notice the "evil weasel" in the bottom left corner of the photo, holding a piece of Kryptonite. 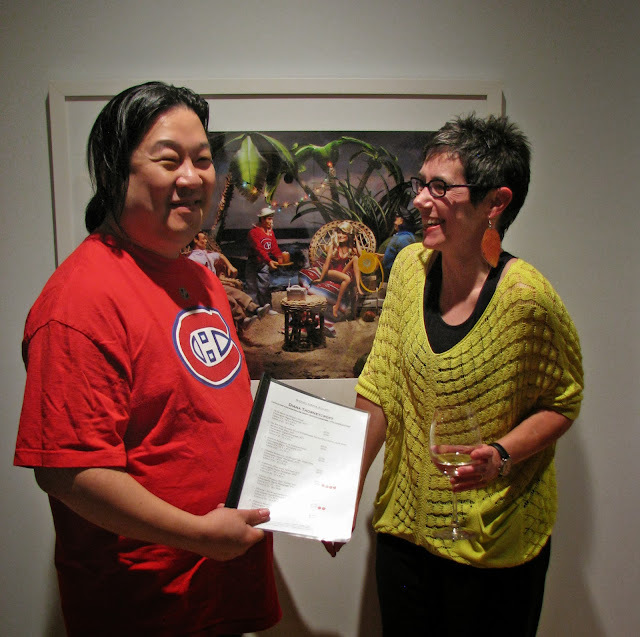 Photographer Diana Thorneycroft (right) jokes with Charles Lee, whose Montreal Canadiens T-shirt echoes the one worn by the Gilligan figure in the photo behind them. 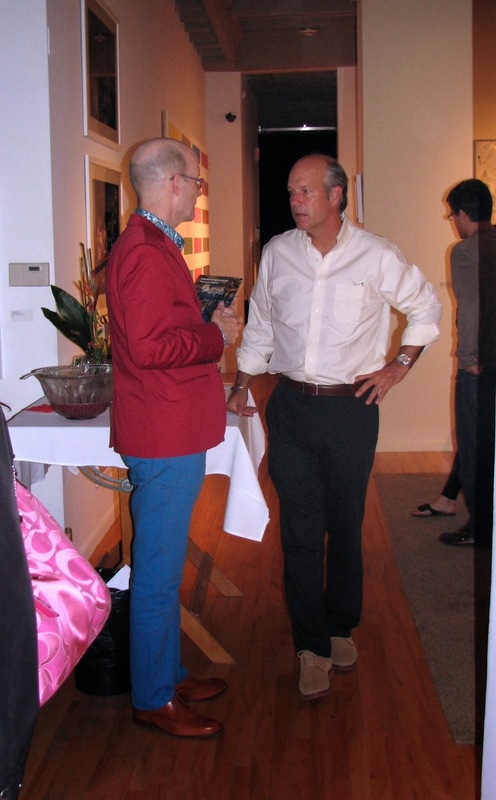 Gallery owner, Michael Gibson (right) talks to Robert Everett-Green from the Globe and Mail, whose fabulously bold jacket and pants stood out amid the sea of dark colours worn by the other attendees. Gallery guests viewing Thorneycroft's "Nighthawks (What Would Jack Bauer Do?)" Yes, that is a Alfred Hitchcock "The Birds" Barbie doll and Jack Bauer action figure in the foreground. 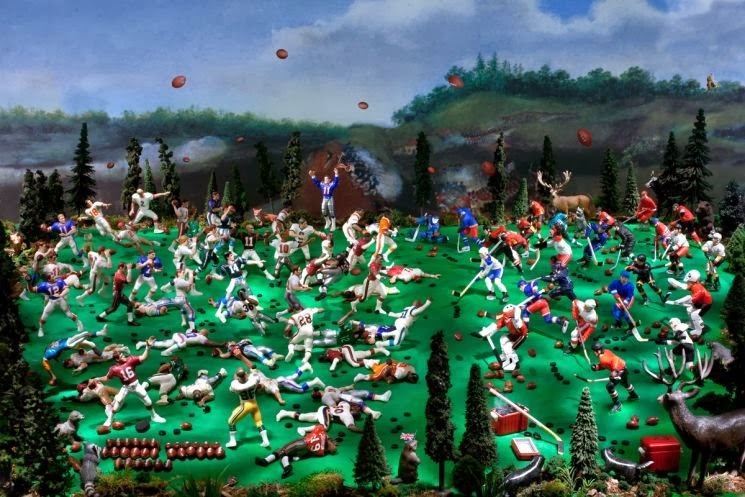 "The Battle of Queenston Heights (War of 1812)"
One of my favourite pieces in the show is the photo above, depicting the War of 1812 as fought with footballs and hockey pucks by American Football players and Canadian Hockey players. Thorneycroft examines the power imbalance that exists in relationships, including the one between Canada and the United States. You can read more about Thorneycroft's ideas behind the works in this exhibit here. Detail of "Battle of Queenston Heights"
Thorneycroft meets London artist Helmut Becker and hilarity ensues. Becker works in paper and flax, and is a Professor Emeritus at Western University, teaching print and paper making. 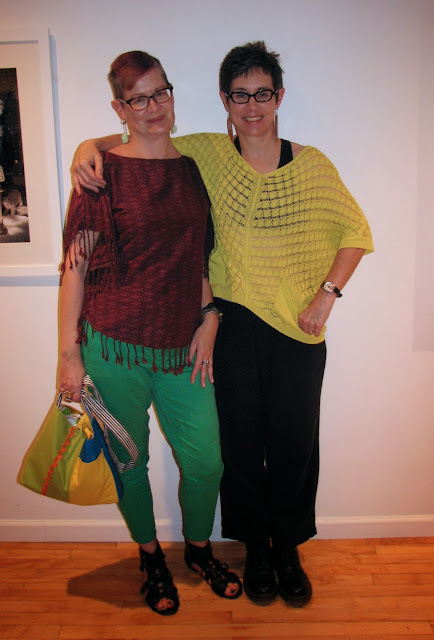 Of course, I had to get a photo with the vivacious artist, who managed to engage in conversation with almost everyone who attended the show. 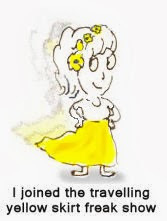 Her open, warm personality made everyone feel welcome, and that their attendance was appreciated. She and I bonded over a mutual love of Doc Martens! The exhibit runs until October 26th. 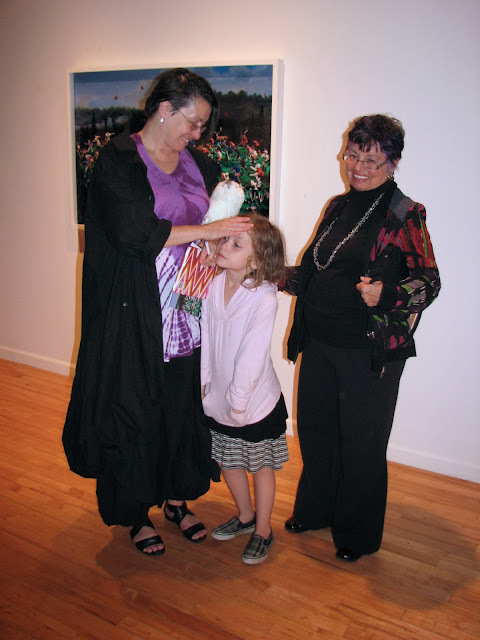 My next post features the art of Vicki Easton McClung currently on display at Strand Fine Art. WOW--I LOVE this stuff--such a bit of snarky humor!! thank you so much for sharing this!! The evil weasel!!! Too cute. I love these photos, they're like stop motion...stopped...?! So much work in these photos, they're really awesome! 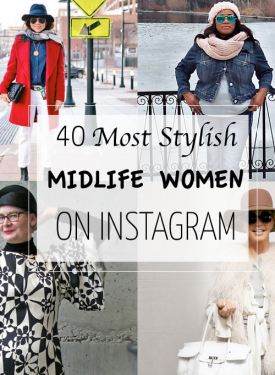 You go to some really cool events, Shelley, and document them so brilliantly. 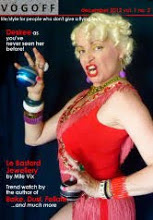 Great review and you chose exceptionally interesting pieces and people to showcase, including your incredible self. It looks to me that London has a thriving art community! I saw one of her shows in Vancouver that played on Group of Seven paintings. One of my friends was pissed off that she had co-opted the works of known artists to catapult herself into the spotlight. I thought her pieces were hilarious. I like that we all have an opinion. You look great here, Shelley!